Filtro AstroSolar con montatura filtri obiettivi fotografici Ø 58mm, Densità 5. O FARLO ENTRARE IN CONTATTO CON OGGETTI PUO’ DANNEGGIARSI. LUCE NON FILTRATA DANNEGGIA SERIAMENTE LA VISTA. Il filtro AstroSolar è uno speciale composto polimerico con spessore di soli 0.012mm, molto resistente. La pellicola è stata trattata su ambo le facce per consentire l’osservazione e la fotografia del Sole in luce bianca in piena sicurezza. Ideale per la costruzione di filtri a tutta apertura per qualunque telescopio, binocoli, fotocamere, videocamere, ecc. Il filtro AstroSolar è stato sottoposto al test di Conformità Europea CE. Ha caratteristiche ottiche di alta qualità. Riduce l'intensità del Sole del 99.999% (1:100.000 D=5). Da non confondere con prodotti similari tipo "Mylar" in quanto la struttura molecolare estremamente fine di questo materiale è il risultato di ricerche nel campo della fisica nucleare e delle particelle elementari. Il rivestimento depositato sulla superficie del materiale è soggetto ad un costante controllo di qualità. Le sue proprietà riflettenti superiori al 99.999% sono state sottoposte a test dal Physicallsch-Technische Bundesanslalt (l'Istituto Tedesco di Unificazione e Standardizzazione) e la sua conformità con la norma EU 89/686 è certificata tramite la concessione del marchio CE. Esso riduce l'intensità della luce solare di un fattore superiore a 100.000 (D=5). Lo speciale rivestimento, che viene depositato su entrambe le facce del filtro, assicura un filtraggio uniforme. La qualità delle immagini solari è migliore di quella che può essere ottenuta usando un filtro di Mylar industriale o di prodotti similari. 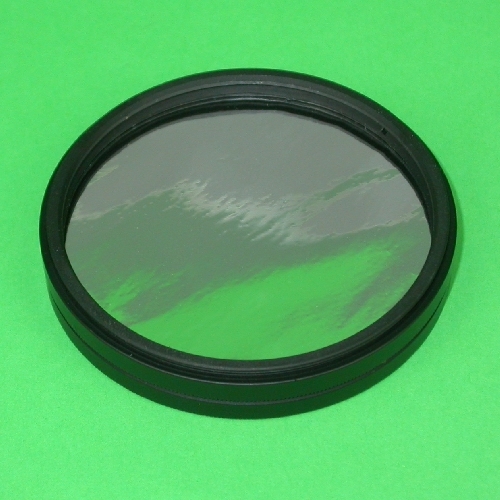 This highest precision film consistently produces strehl ratios of 94 to 96 percent at interferometric tests - thus it performs optically like a Fluorite Triplet Lens by Carl Zeiss or Astro Physics (Interferometric test results). Unfortunately we have a hard time ourselves to see any difference in performance between AstroSolar™ and 1/20 wave precision optical windows which we are stocking here from Zeiss. Our stock of precision polished plates runs into tenths of thousands of $ - all stocked in for the 1999 eclipse - but AstroSolar™ was so good in fact, that these plates are hard to sell. 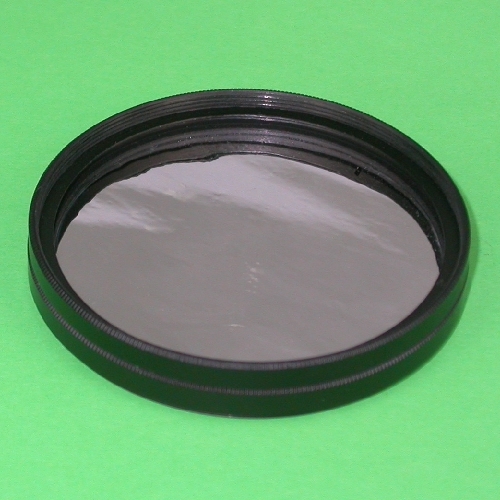 Our Safety Film shows notably more sharpness and contrast than any competitive product we know of, especially including all affordable US-Glass Objective Filters. What is even more important - with AstroSolar™ the Sun appears in it' s real color - neutral white. Other films and most glass filters produce a blurry bluish or reddish Solar image, thereby cutting part of the spectrum. Especially with an orange sun, it is very hard to see faculae regions which are visible predominantly in the blue wing of the spectrum. Baader Planetarium delivered solar safety film for 19 million eclipse viewers that were used throughout Europe for the August 11. Eclipse. Not one user of our films has suffered from eye damage. We produce solar safety films for over 17 years and have reason to claim a high degree of competence for all aspects of solar observation. With Baader AstroSolar™ we are set out to show you the Sun' s hidden grandeur at a fraction of the cost for comparable equipment. Real professional solar work was always restricted to a few hardnecked amateurs who would put up the $1000,- or more for a real precision 1/20 wave glass filter or 2" Herschel wedge (all items which we have on stock). 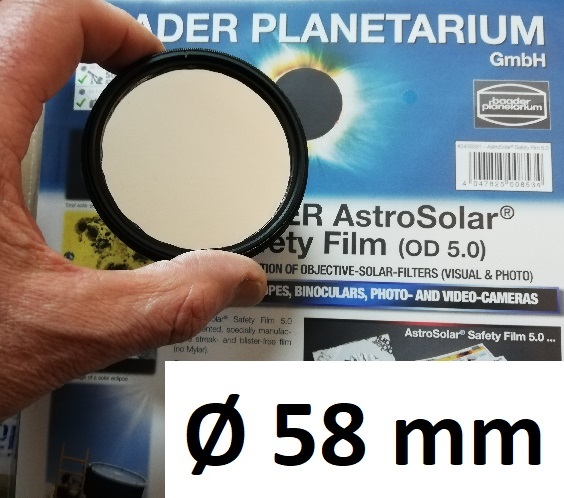 Now you can get an equally precise AstroSolar™ filter to fit an 8" aperture for $ 30,- (or much less even, if a whole group of people shares a larger roll of 100x50 cm size film). Not longer will solar observation be a "so la la" experience, where you look into your telescope through an "economy priced" glass filter and wonder what this kind of amateur activity is all about. Many of our customers have pushed out their older filters to use their filter cells for AstroSolar™ - all they were in for a completely new, crisp and increadibly esthetic sun. All of a sudden, the telescope has the same performance during the day that it has at night. Always we were amazed how easily amateurs would accept mediocre sharpness during observation of our nearest star, while they can be extremely critical if the telescope would not perform perfect on other stars. 2. TurboFilm™ , as night time protection of your valuable optical equipment; to shield it against dirt, scratches , coating defects, humidity inside open tubes and on mirror surfaces - and last not least, to stop air currents (tube-seeing). We offer two densities of AstroSolar™, since passionate Solar photographers have always critizised that the visual density of D=5 would be too dark for eyepiece projection work. Accordingly we manufacture brighter "AstroSolar™ Photo Film" with density D= 3.8, to provide short exposure times when using eyepiece projection. AstroSolar™ OD=3.8 PhotoFilm offers short exposure times up to 1/5000 sec. AstroSolar™ PhotoFilm is not intended for visual observation. PhotoFilm is only for use with telescopes for high magnification photographic work. Do not use it for producing solar eclipse viewers, do not mount it onto DSLR camera lenses.